I get asked a lot about Shakeology and how it compares to other shakes that are much cheaper in price. The truth is, yes, other shakes are cheaper. 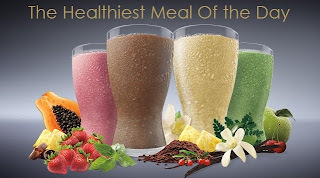 Other shakes; however, do not have what Shakeology has. 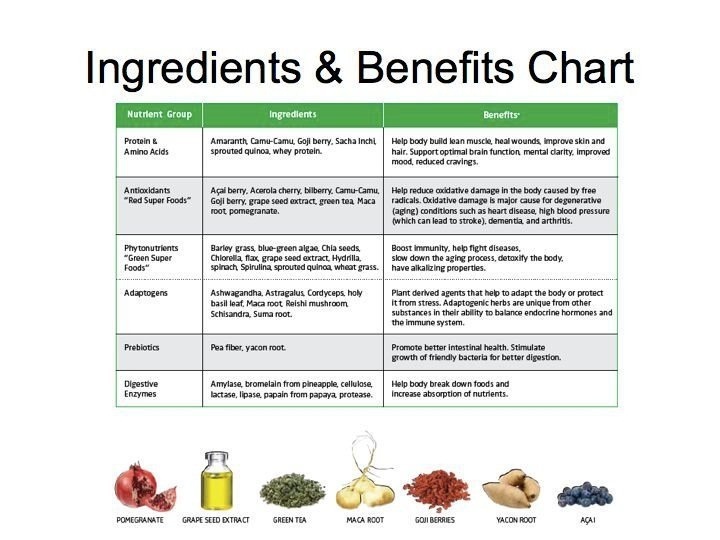 So I ask, would you rather spend the money to get something that you know is good for you? Or would you rather spend less money on something that may not be as satisfying and nutritional? The other approach that people tend to take is the whole, drinking a shake for a meal. I will be the first to admit that I was an anti-shake person. I thought people were CRAZY for drinking a shake to replace a meal! There have been many times at lunch where I would watch my co-workers slurp down a shake while I sat there and ate my food. I felt so bad for eating in front of them and the look on their faces said it all! So when I joined a Summer Slim Down Challenge group, I knew that I would have to give it a try. The only reason why I was ok with it was because I'm not a big fan of cooking, and this would take at least one meal away from having to be in the kitchen! So when I got my Chocolate Shakeology, I figured I'd give it a try before the first day of the challenge group. I took the advice from my coach and mixed one scoop of Shakeology with 1/2 cup water, 1/2 cup Unsweetened Almond Milk, and Ice. I bought myself a handy blender from Target and blended away! I was pleasantly surprised at the taste! I'm pretty sure within five minutes the entire glass was gone! I almost felt guilty for enjoying what tasted like a chocolate milkshake for breakfast! What was even more amazing to me was that I felt full! I was typically a bagel or sugary cereal type of person and even after I'd eat either, I felt like I could still eat more. Worse yet was I felt starving within the next hour! So it was nothing short of a miracle that I not only drank a chocolate shake for breakfast, but I wasn't even hungry for at least 2 1/2 hour or so later! As my challenge group continued I experimented with different recipes. I found that adding a half banana was delicious; however, my favorite it add a small amount of mint extract. I love the chocolate mint taste! I owe Shakeology to a large portion of my success on getting fit and healthy. It is my go-to if I know I'm going to be somewhere that won't have healthy choices for me. It is my go-to for my sweet tooth, which I definitely have. And it is my go-to for my healthiest meal of the day. Needless to say, the only regret I have it not trying it sooner! 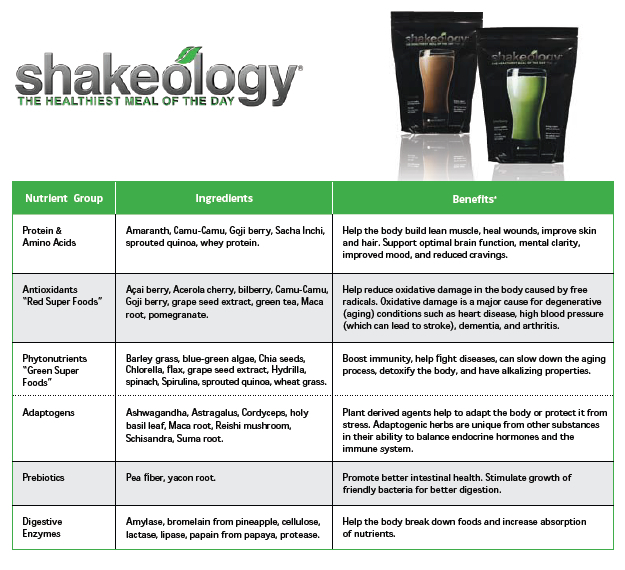 So, now that you know my story behind drinking Shakeology, you are probably thinking, what makes it so healthy? 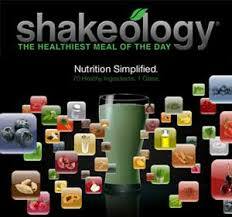 ﻿Shakeology is a nutritional protein shake that provides a wide spectrum of healthy nutrients in a low-calorie formula. Whether you use it as a meal replacement for weight loss or simply to ensure your body gets all the nutrients it needs for optimal health, Shakeology takes the guesswork out of nutrition. Shakeology contains over 70 ultra high-quality ingredients conveniently located in one glass, to deliver nearly all the nutrients you need to maintain a healthy diet. It's good for you, and good for everyone, because everyone's diet is deficient in some of the key nutrient groups packed into just one Shakeology serving. Protein from whey, which is highly absorbable, gives you 8 essential amino acids that help you build muscle, lose weight, support brain function, and keep your skin and bones healthy. 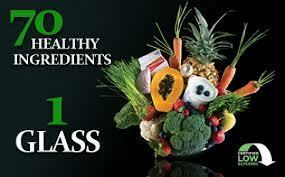 Vitamins and minerals support optimum health. 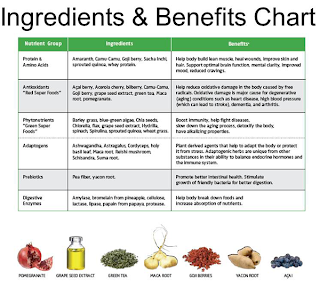 Antioxidants boost the immune system and help reduce free radical damage that can lead to heart disease, heart attacks, blood pressure, and stroke. 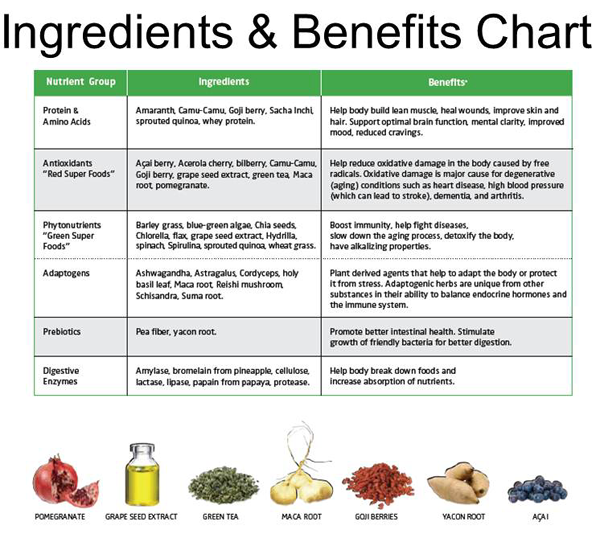 Phytonutrients support immune function and have anit-inflammatory properties. Prebiotics support digestive and immune health. Digestive enzymes help in the digestion of foods and increase the absorption rate of those foods for optimum health. Shakeology is an easy meal that ensures you are getting the nutrients you need for the day. It is equivalent to 5 trips to the salad bar! Everyone is busy in one way or another. Everyone has hectic days. Why not have a quick meal that you can shake or blend up in less than two minutes? A meal that can give you the energy you need to keep up with your daily schedule! A meal that you can take on-the-go for those busy days! There are various recipes that you can try and you have the ability to make the consistency the way you like it! Personally, I LOVE milkshakes, so, I blend my Shakeology with a little bit of ice to have a thicker creamier texture. Delicious! Hilarious Video! Check it Out! Worried that you may not like it? I doubt that will happen; however, in the event that it does, you can cancel at any time for no fee. 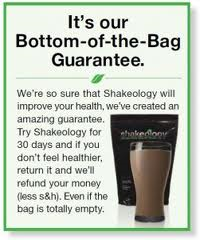 Shakeology also has a 30 day Bottom-of-the-Bag guarantee! You can return your empty bag for a full refund! Are you interested in trying Shakeology or getting more information? 3. You can PayPal me to purchase individual servings for $5 per packet! Please email or message me to check in-stock availability. 4. Order either a 30 day supply bag (1 flavor of your choice), or a box of 24 individual packets in a variety of flavors. By choosing the Home Direct (HD) option, you will not only receive free shipping, but it will automatically arrive at your door step each month!